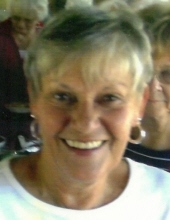 Elizabeth “Junie” Merriman Herrington, 77, of Fieldale, VA passed away peacefully on Friday, November 23, 2018 at her home. She was born January 17, 1941 in Fieldale, VA to the late Troy Merriman and Audrey Neal Merriman. Mrs. Herrington was a member of Fieldale Baptist Church where she served as a deacon and was part of the bell choir. She is survived by her family, loved ones, and people in her community. A memorial service will be held at 1 p.m. on Wednesday, November 28, 2018 at Fieldale Baptist Church with Pastor Dan Schelling officiating. Visitation will be one hour prior to the service from 12 p.m. to 1 p.m. Entombment will be at Roselawn Abbey. Norris Funeral Services, Inc. and Crematory of Martinsville, VA is serving the Herrington family. To send flowers or a remembrance gift to the family of Elizabeth Merriman Herrington, please visit our Tribute Store. "Email Address" would like to share the life celebration of Elizabeth Merriman Herrington. Click on the "link" to go to share a favorite memory or leave a condolence message for the family.